Follow the first three paragraphs as directed, then freeze the cooled fries on a parchment paper–lined baking sheet. Transfer the frozen fries to a resealable freezer bag. 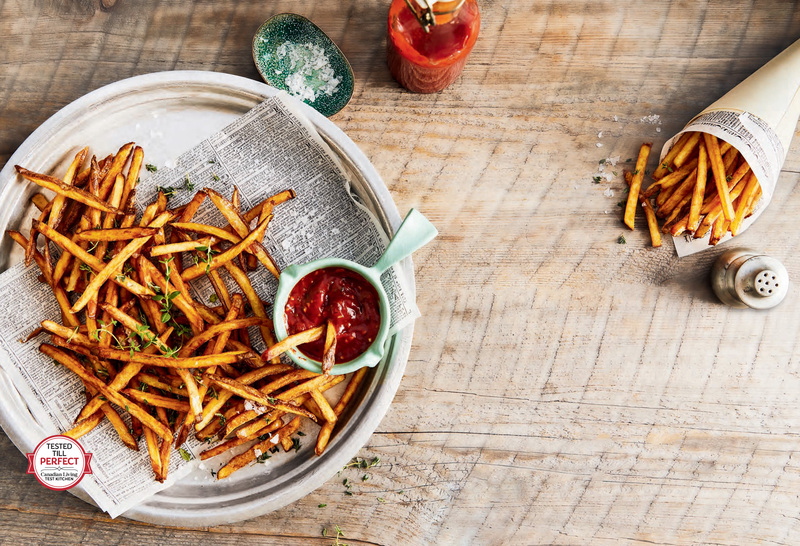 Continue with the recipe as directed for fresh french fries in minutes. In large bowl, cover potatoes with cold water; drain. Repeat until water runs clear. Cover with cold water; refrigerate for 1 to 24 hours. Drain. Place 2 racks over 2 baking sheets. In large pot, bring vinegar, salt and 12 cups water to boil. Add potatoes; return to boil and cook for 2 minutes. Using large slotted spoon, transfer potatoes to prepared racks, spreading in single layer. Let cool completely, about 10 minutes. In Dutch oven or deep heavy-bottomed pot, add enough oil to come 1½ inches up side; heat over medium heat until deep-fryer thermometer reads 350°F. Working in batches, deep-fry potatoes just until tender, about 3 minutes, returning oil to 350°F between batches. Using large slotted spoon, transfer french fries to prepared racks. Let cool completely, 8 to 10 minutes. In same pot, reheat oil over medium-high heat until deep-fryer thermometer reads 400°F. Working in batches, deep-fry french fries until crisp and golden, about 2 minutes, returning oil to 400°F between batches. Using large slotted spoon, return french fries to racks. Season with flaky salt while still hot (if using). PER EACH OF 8 SERVINGS about 288 cal, 3 g pro, 21 g total fat (2 g sat. fat), 23 g carb (2 g dietary fibre, 1 g sugar), 0 mg chol, 111 mg sodium, 521 mg potassium. % RDI: 1% calcium, 8% iron, 12% vit C, 4% folate.